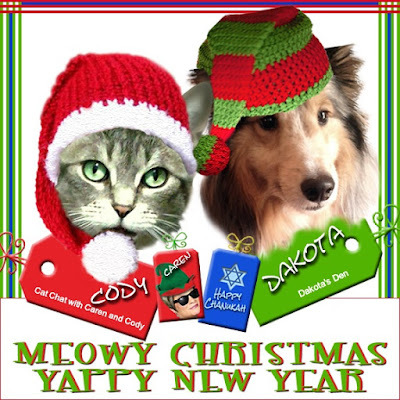 Cat Chat With Caren And Cody: "Happy Christmas" to All! Cody and I were completely overwhelmed by the number of cards that we received, via email and snail mail!! While you are enjoying your holiday festivities, we want to thank you for your friendship, love and support and for taking the time out of your busy schedules to visit us! "Happy Christmas" to All! We LOVE YOU!! If we missed adding anyone's card, this video was created on December 23, if any cards arrived after that, we apologize that they were not included. (This video only displays the cards we received via email, to see our snail mail cards, please visit Dakota). We hope to be posting the cards that came in after this was made, on December 27th. For those who may not have received our card, here you go! It was created by Ann from Zoolatry and we love it! Oopsie! Um...did you not get ours...we posted it to be snagged, but don't worry, it was fun to see all the others in a slide show like that, way coll with the background to display them! If we post ours it will just be in a line as pictures in our blog...our meowmy is a simple simon when it comes to that kid of thing...MOL! Love the video and the cards are just lovely. What cool cards! We don't send out cards here very often, I gather, and none were sent this year. Seasons greetings to you! Thanks! Oh, I had noticed how beautiful the card was that you sent to Peaches and Paprika, it was so pretty! Have a wonderful holiday! Thank you! Merry Christmas to YOU!!! We were overwhelmed with cards this year too - Mom and I couldn't keep up with them - coming in from EVERYWHERE. Amazing....but we loved each and every one of them and we're sure we've missed telling someone that but hopefully everyone knows we LOVE LOVE LOVE our friends all over the world. We hope you have a great holiday - and thanks for being our friends....let's all hope for a peaceful and happy new year. I scan my snail mail cards and can do 3 or 4 at a time. It makes it much easier to put them in a post. Thanks for including us! Happy Holiday to you from all of us! you are welcome. Happy Holidays. So many beautiful cards! Happy Holidays to all of you! Caren, what a stunning display with the music and all. Our card is late but been posting all kinds of variations on Twitter and Fb. xo, Layla and the boys and gal. I was a shameful slacker of a human this year and didn't get any cards out. Shame on me! But, we hope you had a happy Chanukah, and that you have a very merry Christmas and a blessed New Year! Thank you for your friendship, Caren, Cody, and Dakota! Oh behalf of Penny the Jack Russell dog and modest internet superstar, I, her alleged human, wish you and all your loved ones, human or otherwise, a peaceful, pawsitive, um, positive Christmas plus a pawesome, doh, awesome 2016. What a wonderful video and all those cards are superb. thank you!! Wishing you a meowvelous Christmas!!! Love the video and the soundtrack (and seing our card in there)! Wishing you a Merry Christmas filled with love and peace! That was a terrific card show!!! Happiest Holidays to you dear friends! Have a super duper, holly jolly, merry merry Christmas! thank you and we wish the same for you!! Pawsome video! We need to do one of our cards too. What kind of program did you use? It's really nice! Thanks...we use ProShow Gold (which we bought) but it doesn't have some of he cool options. Cody, we wish you and your family a happy and peacefull Chritmas. That's a beautiful video!! Merry Christmas!! You have lots of lovely cards. The one you didn't have a name for is the Trout Towne Tabbies. We too were shocked and amazed and blest at how many cards we received. Merry Christmas to you all. We're so glad y'all are our furiends. Love you dear friends. Wish we had enough time to comment every day. Happy Holidays to all of yous! May your life be filled with the wonder and hope of this special time of year all year! What a lovely way to display all your beautiful cards! Thank you for being such great friends. We love you, too. What a wonderful video, love it, you did an amazing job with it! Happy Holidays and Merry Catmas to you Caren & Cody! Such a touching and heartfelt video! Holiday wishes to you and yours on this blessed and beautiful day from all of us at Zee & Zoey's Cat Chronicles. Merry Catmas, Cody, Caren, and Dakota! Merry Merry Christmas Cody, Dakota and Caren!!!!! Happy Holidays, Cody and peeps! That's a lovely slideshow of all the cards! Thanks for sharing and Happy Holidays from us to you! We came by on Christmas Eve and thought we left a message - guess not! Hope you guys had a great Christmas and love the video! We absolutely love the Christmas card slideshow you did - what a fabulous idea and a beautiful keepsake from Christmas 2015! Sending much love to you and your family! A great idea. We loved the card video. The starry eyed cat you didn't recognize is Loulou from Living with Loulou on blogspot. Sorry. Living with Loulou dot com is the correct url for the starry-eyed cat. Those are all great cards, I enjoy seeing everyone's unique creations. Hope you had a pawsome catmas holiday !